Curology is a company that creates a cream just for you based on your skincare concerns, whether its acne, hyperpigmentation etc. You tell them your concerns, send pictures of your skin and a dermatologist or Physician Assistant takes a look and determines what your custom cream should contain. Awesome idea! I stumbled upon Curology one day on Instagram. I actually don’t even remember how, but it may have been a sponsored post. I noticed that there was nothing but love and positivity in the comments so I decided to explore further. The before and after pictures are phenomenal! I was shocked! I’ve had cystic acne since I was about 26 years old. Prior to that I had no problems with my face, so it was weird that it would break out all of a sudden. I’ve gone to several dermatologists and have gotten medications that didn’t work and some that actually did work, but my skin was never consistently in good condition. The day I saw the Curology post, my skin was in the middle of breaking out really bad so it was right on time. I had nothing to lose. It’s free to try, all you pay for is shipping. I cant wait to see how well it continues to work! If you’re interested in trying it along with me, please use my referral link… Curology! 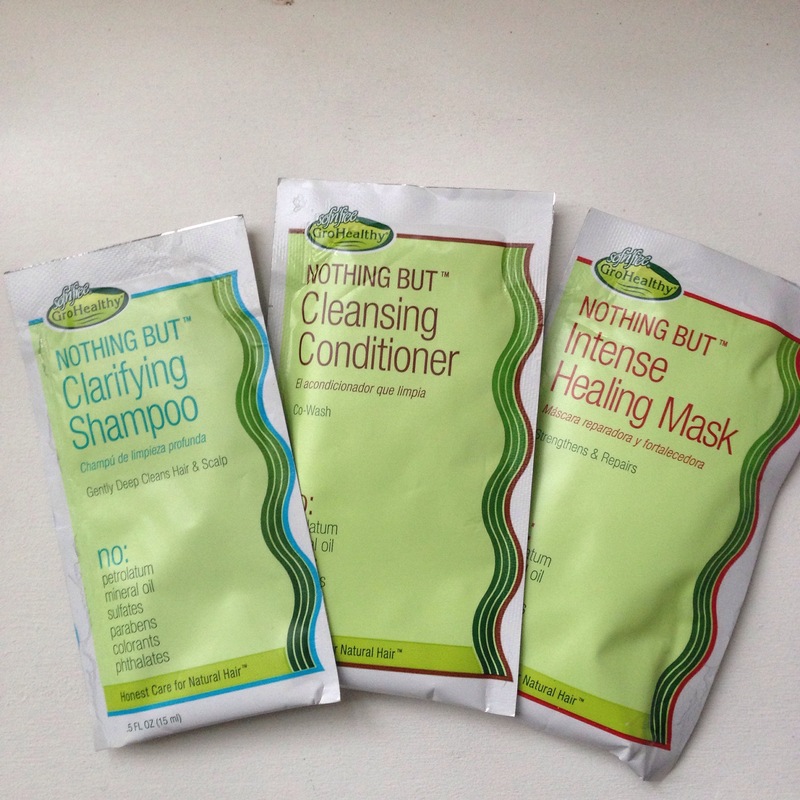 Yesterday was washday and I decided to use my Nothing But Sampler Pack. I used the Clarifying Shampoo first. I liked the consistency of it. It was more like a jelly than runny like most shampoos. I got good lather and my hair felt really clean after just one wash. It worked well as a clarifying shampoo, especially after a week of wearing my hair straight. It was just what I needed. I used the Creamy Cleanser next. I generally don’t like creamy cleansers because I don’t co-wash my hair. This one was no different. I didn’t feel like it really cleansed or conditioned. I couldn’t imagine using it alone as a cleanser. Then again, according to the instructions it was the second step, so maybe it wasn’t meant to be used alone. Next I used the Intense Healing Mask. I was a bit skeptical at first about how well it would work, but it felt great when I put it in my hair. I left it in for about 30 minutes. To my surprise, my hair felt moisturized after. Of all of the products I tried from this line, this was my favorite. These products were mostly unscented, which was cool for a change. I’d rather that than a scented product with a scent I dislike.